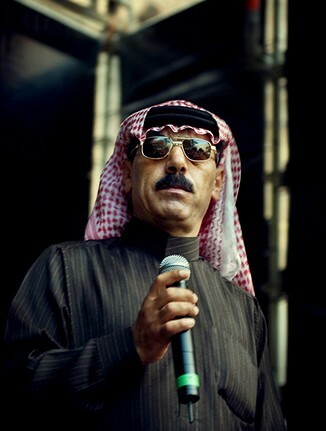 On hearing Omar Souleyman’s music for the first time this autumn, I was drawn to the raw and exciting quality of his voice. I knew nothing about him or the kind of world he had come from, but I had a response to it that made me want to find out more. I looked into his back ground. He was a singer who grew up in the North Eastern region of Syria, born into an Arab family. He worked as a labourer and only began a musical career in the 1990s, when he became a successful wedding party performer playing dabke, traditional folk dance music. With his keyboard player Rizan Sa’id and Saz player Ali, he developed an infectious style. They still play with him today. r at one side. It was hard to see the performers above the crowd. The acoustics were also poor. became very lively when Souleyman’s band took to the stage. I felt the crowd wanted to have fun. Souleyman is not loved by all lovers of music in Syria and the Arab world, and some find him coarse and unsophisticated. This is probably fair comment, but it is also what makes him interesting to Western audiences, especially the dance world. He has performed extensively in the West since Mark Gergis encouraged him to release music on his Sublime Frequencies label (the three CDs are ‘Highway to Hassake’ 2006, ‘Dabke 2020’ 2009 and ‘Jazeera Nights’ 2010). He collaborated with Bjork and recently played at the 2013 Nobel peace prize concert in Norway. This year has seen the release of a studio album called ‘Wenu Wenu’. The title track means “Where Is She?” It is a driving, dance-floor tune which may be seen as an allegorical tribute to Souleyman’s beloved home country. Over runs of fluid synth and a dance beat, he cries out to a lover who he is estranged from: “How are you doing, my treasure? You’re always on my mind.”I felt it was music without too much intellectual concern, but it had a raw soul to it that worked well in a live performance. I wonder how the artist felt to be estranged from his homeland and touring the world. He is not a young man. I assume there is an aspect of money and survival. But there you have the rub. Art and life and survival – the hands are joined and also apart. The crowd at the gig danced enthusiastically, and when the stage went quiet and the lights came up we all went off into the London night with exciting new sounds ringing in our ears. I for one felt something inside. Even if it was from far away. Don’t we all like to feel something inside? Music can do that.